A flagpole requires removal when it severely rusts or suffers other damage that threatens the structural integrity of the pole, or if the flagpole outlives its usefulness. Safety is first when working with a tall pole. Simply cutting the base of the pole poses a serious hazard. 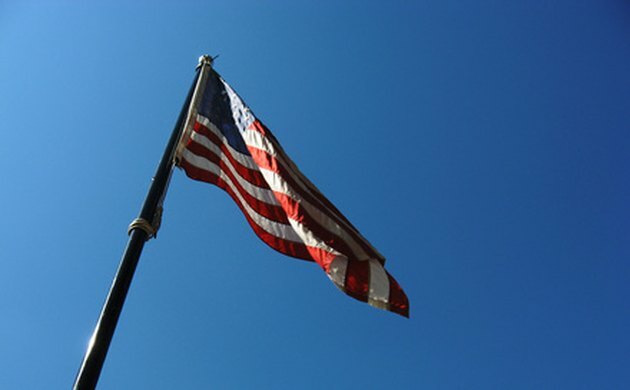 There are two types of flagpoles, each of which has its own removal method. Remove tall, damaged flagpoles safely. Block off 50 feet in each direction of the flagpole to ensure safety for those in the surrounding area. A faulty pivot and lock pin can cause the pole to fall abruptly. Don a hardhat, safety goggles and gloves. Locate the pivot and lock pin, typically installed at the base of the pole. A pivot and lock pin is a metal pin that holds and locks the pole in position. Depressing the lock or easing the pin out slowly allows the pole to drop down at an angle in the direction of the ground. This motion brings the pole to the ground level slowly and safely. Use a reciprocating saw to cut the pole into smaller, manageable sections until only the flagpole base remains. Replace with a new flagpole, or dig out the concrete footing holding the flagpole sleeve and remove entirely. Block off 50 feet in all directions around the flagpole to maintain ground safety. Disturbing a damaged flagpole can cause the pole to suddenly fall. Rent or lease a bucket truck from a heavy equipment rental agency in order to reach the top portion of the flagpole. A bucket truck is a piece of heavy equipment with an arm that raises and lowers a bucket, or partially enclosed standing area. Tie a rope to the top of the flagpole and use a reciprocating saw to cut through the flagpole below the rope. Wear a safety harness tethered to the bucket. Lower the flagpole towards the ground. Have a helper on the ground untie the rope. Then you pull the rope back up and tie it to another section, cut, lower and untie until only the flagpole base remains. Flagpoles are generally hollow and lightweight, making lowering pieces to the ground easy. Replace with a new flagpole, or remove the concrete footing holding the flagpole sleeve entirely.